Earlier this month I met Randall Peceur (pictured above) at Cape Wine Europe. I’d first encountered Randall some years ago in Bellevue Estate winery when he was working in their tasting room pouring wine for visitors. Now he is the managing director of Sizanani Wines, the empowerment company set up by Bellevue and now 100% owned by the workers at Bellevue. In the above video Randall talks about the benefits of empowerment to the workers and tells us about the 2008 Sizanani Pinotage. 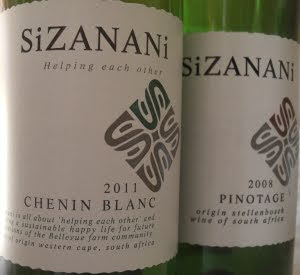 Sizanani has had export success including a contract to supply own label Chenin and Pinotage for UK supermarket chain Morrisons. I was keen to taste Sizanani 2008 Pinotage. I was surprised at that 2008 vintage was still current but Randall explained the wine had long aging in old wood barrels. The wine had an attractive lavender nose, it is light in colour and lightweight in the mouth. Randall said the intention was to make an easy drinking wine to attract those that didn’t usually choose wine. It is certainly easy pleasant drinking but my own tastes lean to Pinotages with a bit more ‘oomph’ about them. 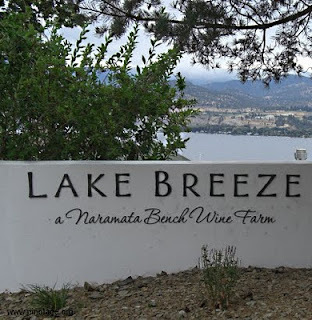 Lake Breeze wine farm occupies a commanding position above Lake Okanagan, on a strip of ancient shoreline known as the Naramata Bench. There are around 25 wineries along this strip of land between mountain and the lake. Lake Breeze is the only one to describe itself as a 'wine farm', a common term in South Africa, where the first owners had lived for 25 years. 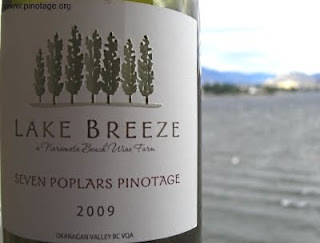 Lake Breeze was the first winery in Canada to plant Pinotage, and 1999 was the first commercially released Pinotage vintage. Only small quantities are made from a lakeside plot less than half an acre in size. Garron Elmes is the South African born winemaker. I managed to grab him away from th harvest for a few minutes to tell us about Lake Breeze Pinotage. I found Lake Breeze 2009 Pinotage bright ruby red, clean and fruity with red cherries on the palate and a hint of cigar box. There was some depth and it was a most enjoyable wine. It costs $29.90 CDN (+tax) at the winery. 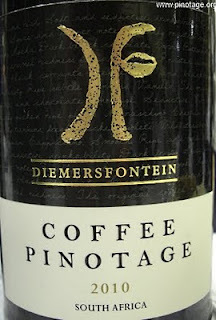 Diemersfontein invented the coffee accented Pinotage category eleven years ago. Their wine has been described as a cult and has a sell out annual festival, Pinotage on Tap, in its honour. 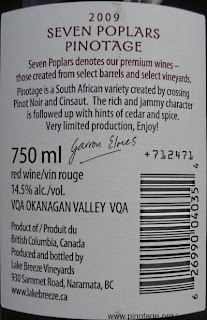 A dozen other wineries have followed their lead by making coffee Pinotages. 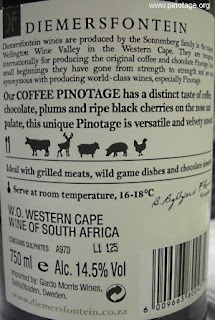 The latest vintage available in Europe, 2010, now says COFFEE PINOTAGE on its front label. But that is not all that has changed. In a move that reminds me of the ‘New Coke’ story, export versions of the wine have had the coffee accents reduced. “This is to let the fruit be more prominent,” says Aubern Williams who staffed Diemersfontein’s stand at Cape Wine Europe this week. “But the original format will continue to be sold in South Africa,” he explained. I don’t understand why the winning formula has been toned down for the export market at the same time as ‘coffee’ has been added to the front label for the first time and I asked Aubern to explain. 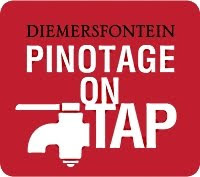 If you are in the Cape then you should be going to Diemersfontein on 22 October for the annual POT day to celebrate the release of the 2011 vintage 'coffee Pinotage' (original recipe) - see here for details. More than 200 wines will be available for tasting, with competitions and biltong and South African Macadamia nuts sampling. Lanny Martiniuk invited me to meet him at his winery. We’d corresponded about Pinotage while I was writing my book and at last I was able to visit his vineyard where he grows eight acres of Pinotage and taste his wines. 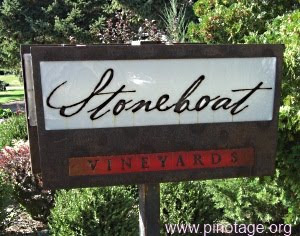 Stoneboat Vineyards and winery are on the eastern bank of the Okanagan River which connects the 85 mile long glacial Okanagan lake with Osoyoos lake, part of linked series of lakes in a very long glacial valley that runs north-south through British Columbia through the US border. The vineyards are 3,500 metres about sea-level and 30.5 metres above the river. Lanny adds nitrogen to the soil and sometimes has to spray sulphur as a fungicide but he doesn’t need insecticides. Stoneboat uses drip-feed irrigation on the Pinotage rows: the southern Okanagan is desert and no crops can grow here without watering. In this video Lanny talks about growing Pinotage on Black Sage Bench. Lanny and Julia have three sons: Chris who works on the farm when not training as a pilot and twins Jay and Tim who work on the farm. Jay is responsible for winemaking and Tim manages marketing. Here they talk about winemaking and more. Stoneboat also grows six different Pinot Noir clones, Pinot Gris and Pinot Blanc plus some white Germanic varieties: Kerner, Muller Thurgau, Oraniensteiner and Schonburger. We left the vineyard to taste wines on the tasting room patio. I had to tell Lanny that I had already tasted Stoneboat Pinotage. A few days before we found the 2008 on the wine list of a restaurant in Penticton. We’d loved its intense fruit flavours and complexity. Lanny started us with Pinot Gris which was dry with a pleasant acidity. Chorus 2010 had an attractive floral nose. Its blend of Pinot Gris, Pinot Blanc, Kerner, Muller Thurgau and Viognier offered a delightful fruitfully complex drink. 2009 Pinot Noir was a pale red with soft fruit and a clean finish. Pinotage 2009 was recently released. It was bright garnet, rather subdued, with a pleasant fruit nose but a little disjointed on the palate. It needs longer to come together. We finished a enjoyable tasting with Verglass 2009, a very sweet botrytis wine made from Oraniensteiner with 5% Pinot Blanc. Just 10.2% abv and a residual sugar of 30g/L from grapes picked at 50-55 brix, this smelled of whole baked apples and had an unctuous sweetness with enough acidity to encourage another mouthful. 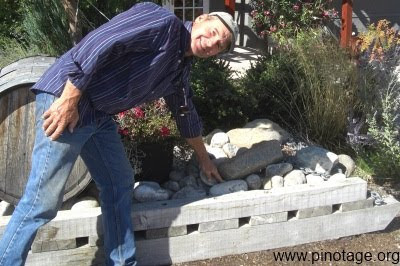 Lanny is a viticulturist who started in the business by propagating and planting vines for other vineyards, and his business continues to propagate thousands of vines for others. This was the first time I have encountered a Pinotage varietal made from vines growing on their own roots. Lanny says he selected individual vines which performed well in Okanagan conditions to propagate so this vineyard is making a truly Okanagan Pinotage that expresses the terroir of this beautiful lake and desert area. Stoneboat’s name refers to the wooden sled (pictured above) used to haul unwanted stones from the vineyard. Lanny says that no matter how many they take out, others work their way to the surface and now they leave them there. The stones are smooth and rounded from millennia in rivers that flowed through here in times long past.